Earn CSU-Global Credits Through Haselden University! Haselden Construction has gone Global – CSU-Global! Get your Bachelor’s Degree through the CSU-Global & Haselden University partnership. 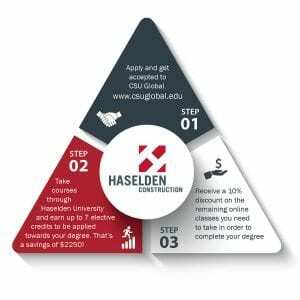 Haselden team members can now earn up to 7 elective credits for courses taken through Haselden University, and apply them to their pursuit of a degree through CSU-Global. To find out which Haselden University classes are eligible and to learn more about the program, take a look at the Haselden University/CSU-Global Flyer.